Saturday October 31st 1925 I wrote to Dorothy Colbert. Nellie Swisher got a message that Susan Garrett died the 29th at 4 PM. Fannie had Mrs Shultz and daughters. Dorothy here with Cora and Hattie here for the afternoon. It is a year today since we laid Vene away. Sunday November 1st 1925 I went to S S and church with Ott. We brought Mrs Rigler home with us for dinner. Later we rode taking Mrs Mass with us. I read a book in evening. 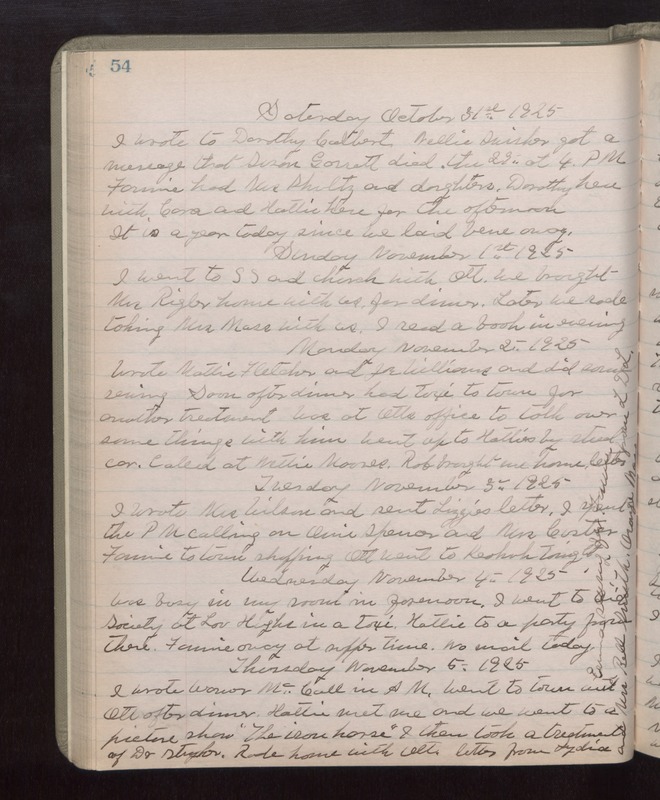 Monday November 2nd 1925 Wrote Mattie Fletcher and Joe Williams and did some sewing. Soon after dinner had taxi to town for another treatment. Was at Otts office to talk over some things with him. Went up to Hatties by street car. Called at Nettie Moores. Rob brought me home. Letter from L D L. Tuesday November 3rd 1925 I wrote Mrs Wilson and sent Lizzies letter. I spent the PM calling on Orie Spencer and Mrs Custer. Fannie to town shopping. Ott went to Keokuk tonight. Wednesday November 4th 1925 Was busy in my room in forenoon. I went to Aid society at Lou Hughes in a taxi. Hattie to a party from there. Fannie away at supper time. No mail today. Emma sewing for Fannie. Thursday November 5th 1925 I wrote Warner McCall in AM. Went to town met Ott after dinner. Hattie met me and we went to a picture show "The Iron Horse." I then took a treatment of Dr Stryker. Rode home with Ott. Letter from Lydia and Mrs Bell Smith, Orange Mass.